China missed out on the golden age of rock’n’roll. While the Middle Kingdom was embroiled in the volatile political movements of the Mao Era culminating in the Anti-Rightist Movement of 1957 and the Great Leap Forward of 1958-61, much of the rest of the world was twisting and swaying to the songs of Chuck Berry and Elvis Presley. And then came the Beatles, who launched the British Invasion and swept away the sounds and memories of 1950s era rock’n’roll—even though they drew heavily from it in their early years—in a tsunami of Beatlemania. All of this was lost on a China that lurched from the back-yard furnaces and mass starvation of the GLF to the terrible violence of the Cultural Revolution years. Meanwhile, rock’n’roll was becoming the soundtrack for America’s tragic involvement in the Vietnam War and the anti-war protest movement it spawned. Since the Opening and Reform era of the 1980s and beyond, as my film Down: Indie Rock in the PRC and my latest book manuscript reveal, China has been playing catch-up, swallowing huge doses of Western rock and pop music from many different eras all at once, and creating fabulously inventive new music in the process. And while that music may be homegrown, it’s hard to deny the important role of foreigners in bringing new sounds and sonic experiences to the Chinese masses . Chasing down the sounds of yesteryear with DJ B.O. On Friday night March 23, I headed out the door of my home in Shanghai and walked through a back alleyway over to Maoming Bei Road to a new bar in town called Hoy Hoy. There I caught up with Brian Offenther, an American DJ and events organizer based in Shanghai, and some other old friends. Brian, known as B.O. in the DJ circuit, has been DJing here in Shanghai for several years now and plays in many venues and events. Recently he has been touring other cities and countries in Asia, including Bangladesh and Myanmar, bringing his eclectic collection of vintage vinyl to folks in these places, while also accumulating more discs in the process. On Friday, Brian spun tunes from a collection of 1950s and early 1960s American rock’n’roll and rockabilly albums, which included Elvis Presley, the Everly Brothers, Buddy Holly, Eddie Cochran, The Contours, Chuck Berry, Fats Domino, and many other pioneers of rock’n’roll. He also spun a few Asian pop tunes that were also inspired by this era, including Singaporean pop star Rita Chao and a very cool band from Cambodia whose name I can’t remember. A small team of male and female hip-hop dancers from the local scene were showcasing their moves to the music as Brian spun his tunes. My 16 year old mother would have felt right at home in this sock-hopping venue. I almost expected Marty McFly to show up on his skateboard and start burning up his electric guitar in anticipation of the next decade of music to come. The Hoy Hoy used to be known as the Grumpy Pig. It was originally set up as a cafe and shop selling DJ equipment and hip clothing by a Shanghainese DJ named Gary Wang, who also was behind the underground (literally) dance club known as Shelter on Yongfu Road. Brian told me he has invested in this new incarnation of the place along with others. 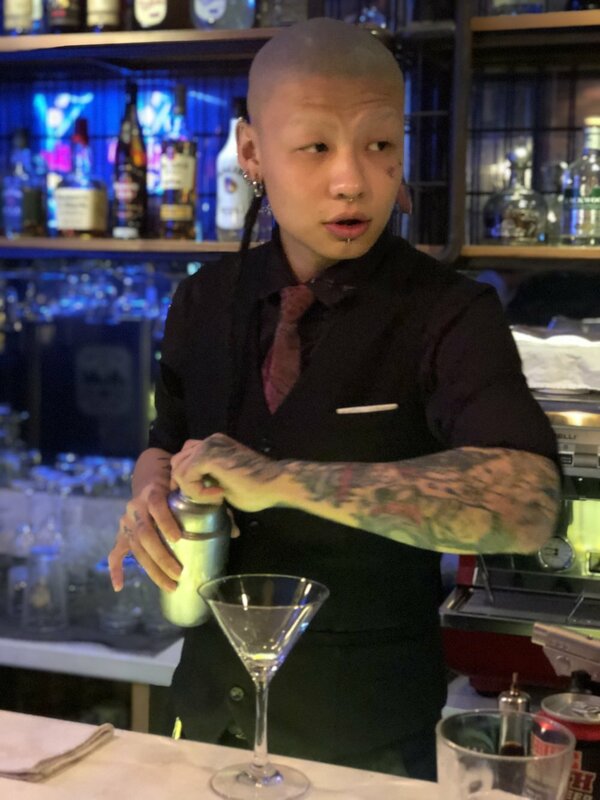 It comes across as a kind of Chinese hipster joint, with a remarkably tattooed and earringed gentleman serving up fancy mixed drinks to a largely Chinese crowd, with a few foreigners in the mix. A neon sign with a guitar saying Rockabilly decorates the front window of the bar, announcing its intention to serve a niche audience with vintage music from America’s Golden Age. After enjoying this time machine back into the American past, my mates and I decided to go back even further—to the 1930s and the age of the great Big Bands. We strolled over to Found 158 and after wolfing down a pizza, we entered the JZ Club around midnight, where we caught the JZ Big Band in full swing. Led by saxophonist and wind instrumentalist extraordinaire, Alec Haavik (a longtime resident of Shanghai), this band features around 20 musicians. It has a very strong horn section, supported by local jazz artist Huang Jianyi on grand piano, with a guitarist, drummer, and bassist to round out the band. In the middle of the set, local legend Coco Zhao joined the band and gave a wonderful rendition of the 1950s song Invitation, followed by My Funny Valentine. These are same songs he’d performed a couple months ago when I first caught the new incarnation of the Big Band, but this time around the band sounded much tighter than before. Clearly they’d been practicing and have really come together as a band—not easy with 20 performers, all of whom are excellent musicians in their own right. The result was an awesome tsunami of sound that brought us all back into the years when America was swinging and swaying to Benny Goodman, Duke Ellington, and Count Basie. After the big band finished its set, pianist Byron Hill Took the stage along with some others to start late night jam session. Unfortunately for this workday sap, late night jams will have to remain a mystery.